This rich illustration of a Gray Jay is by Canadian ornithologist and artist Allan Brooks. The jay is perched on an evergreen bough. 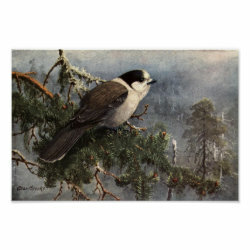 This classic bird art reproduction makes a great gift idea for anyone that loves these intelligent birds of the north!